Juicy Couture is one of those brands that are particularly popular with well-heeled young women and those who want to appear to be on their way up. Originally founded by Pamela Skaist-Levy and Gela Nash-Taylor, the brand epitomises the millennial thrust of Los Angeles into the fashion foray; buying power combined with a petulant desire to keep fun at the heart of what fashion. Now owned by the Liz Claiborne Inc., the brand has grown from its roots in a precocious notion of cool into an adult business that caters to those who are still not entirely decided. Way back in the tail end of the 1990’s, the founders – Gela was actually the wife of Duran Duran pretty boy John Taylor- understood the clever marketing of positioning a brand correctly. The brand’s seminal steps saw it placed in some of the most influential department stores, particularly in the significant American market. Whilst rapid diversification was always part of the plan –an aspect continued under subsequent ownership- Juicy Couture fundamentally remains a lifestyle brand; for women, men and, indeed, their pets, who are fortunate enough to move in the fast lane. So, when we are already trained to be thinking about the coming winter when (theoretically) it is still summer, why should our pets be left out? Congruent with the gang of luxury brands that understand that our pets remain important to us, Juicy Couture is one of those brands that have produced a range of special dog apparel for quite some time. It’s no curve ball then that the coming cold season might actually be a time when it is as important to us that pooches not only have the necessary comfort to deal with the cold, but also look stylish. 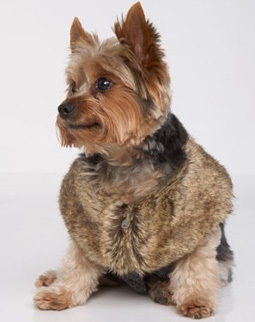 With fur, once again, being a big prediction for the autumn and winter of 2010/2011, it’s no surprise then that the drop-dead trendy label of Juicy Couture would produce a range of stylish doggy looks – in varying sizes, naturally- that incorporate the furry outlook into the fashionista mutt’s wardrobe. Needless to say, most of these funky looks are sensitively achieved in faux fur. 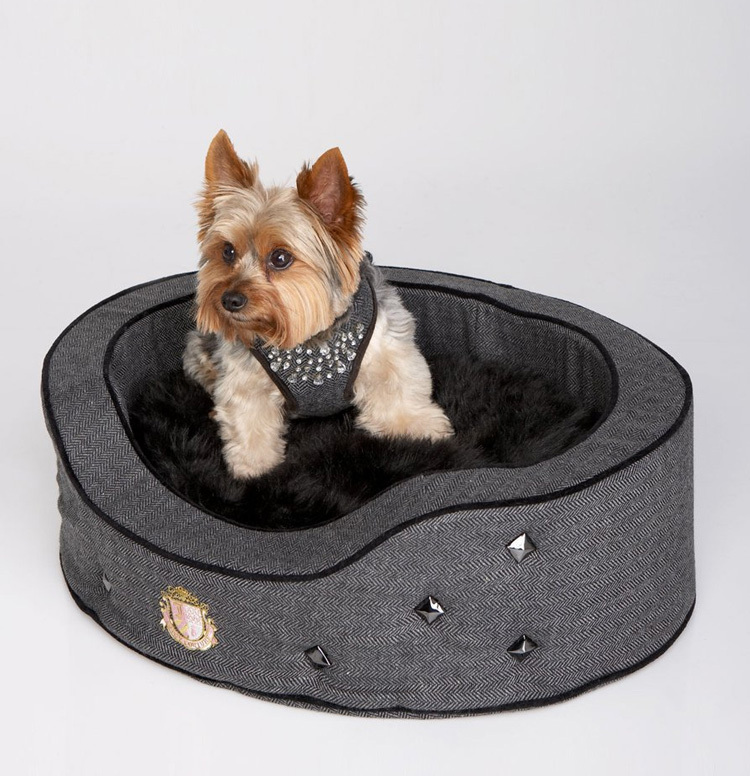 But Juicy Couture is also one of those brands that instinctively understand that every faithful companion needs a suitably chic pad in which to rest and dream doggy dreams. Not limited to nifty little outfits for theses child replacement accessories, Juicy Couture’s offer extends beyond mere party outfits for our canine companions to include hip cushioned abodes.